I realized recently that I had no idea where many people in the Intellectual Dark Web actually stood on key positions. I thought I knew—sort of—but it turns out that most of what I knew was coming from a shoddy skyscraper of misconceptions. I did a post recently about Renée DiResta being on Joe Rogan’s podcast, and in the comments I learned that she was evidently some sort of shill for…I’m not sure who. I guess for the Democrats? I also learned recently from other readers that Joe Rogan was alt-right. I was being attacked by alt-right types saying DiResta part of a pro-Clinton conspiracy, which was ridiculous. Really? Joe Rogan? A conservative? The mediation, cannabis, commedian who’s for gay marriage and pro-choice, and income equality? I then made the mistake of thinking Dave Rubin was conservative as well, since he’s often labeled that by the extreme left. I’m an MMA fan, and I have followed Sam Harris since the very beginning, so Rogan and Harris were already in my awareness and thus I could tell when they were being maligned fairly easily. But when it came time for me to describe people like Rubin, I realized I was committing the same errors as everyone else. If you’ve not listened to a large body of someone’s work—both in good faith and over a long period of time—you can’t hope to understand them. So I decided this weekend to do the research to figure out what these people believed on all the major issues, and that’s the spreadsheet you see above. During the research I started noticing some weird stuff about this supposedly hateful IDW group of Harris, Weinstein, Rubin, and Shapiro. Namely, they’re all Jewish, and yet a number of them are often labeled as white supremacists and even neo-Nazis. That completely breaks the stupidmeter. Ben Shapiro—yes, the conservative one—actually needs private security because of his open criticism of the alt-right. Shapiro has also been in very aggressive debates with Milo Yiannopoulos, who is a vocal proponent of the alt-right, and that public disagreement has become quite ugly. And just yesterday I heard one of the most encouraging and heart-warming discussions I’ve heard in a long time between Joe Rogan and Ben Shapiro, where Rogan (gasp) takes the liberal positions and Ben debates from the conservative side. And in both cases (Rubin and Rogan) the conversation was civil and productive. Peterson is something of an exception here. 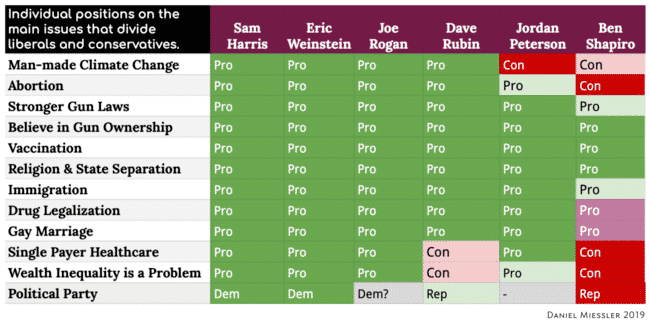 If you look at the chart I made at the top of this piece, you can see that almost everyone is extremely liberal—including people like Rogan. Their binding factor—which is what brings Shapiro into the mix—is that they’re willing to have good faith conversations with people they disagree with. And I think that’s glorious. You really should watch the recent podcast with Joe and Ben. It’s an unbelievably refreshing conversation between two people who greatly disagree about fundamental things. I can’t quite figure Peterson out, so I’m withholding judgment on that one. With the exception of Ben Shapiro, who is super libertarian and doesn’t want to impose his religious ideas upon you through government—and Jordan Peterson, who seems to constantly send mixed signals to me, the vast majority of people in the IDW are extremely liberal on all of the core issues like abortion, climate change, gay marriage, etc. They’re not neocons, they’re not alt-right, and they’re not racists. They’re the opposite of that, actually, and the main thing they have in common is the desire to preserve and amplify good-faith conversation. Either way, I urge you to join us in resisting the urge to shut down difficult conversation, because that’s precisely what creates the empty stage that empowers the alt-right. Apr 6, 2019 — I reached out to Sam and updated the sheet to mark him as fully pro on single-payer healthcare. He also suggested adding Wealth Inequality as a topic, which I did. Apr 6, 2019 — I corrected Eric’s name, where I had Bret initially. Although Bret is also a member as well as far as I can tell. Apr 7, 2019 — It seems Rubin has/is shifting ever more right, so it’s hard to know how much of his liberal stances remain, if anything. I’ll be updating the chart soon. Apr 12, 2019 — Updated the chart with political party and some updated positions. For the table at the top I basically spent many hours going to find where each person stood on those key issues. It really needs to be sourced to be most useful, so I’m going to be collecting each source in the Google Spreadsheet I used for collection.